"This independence advantage will be of greatest benefit in our relationship with the EU"
Scotland's Future (SNP White Paper), p229. If you have the time to read the White Paper I suggest you play close attention to the semantics (I have). You might skim the document (or listen to some of the Separatist rhetoric) and come away with the impression that the line is basically "We will negotiate to stay within the EU and you can expect us to retain all the opt-outs we currently enjoy as part of the UK and negotiate other benefits for an independent Scotland at the same time". "We recognise that specific provisions will need to be included in the EU Treaties as part of the amendment process to ensure the principle of continuity of effect with respect to the terms and conditions of Scotland's independent EU membership, including detailed considerations around current opt-outs, in particular the rebate, Eurozone, Justice and Home Affairs and the Schengen travel area"
"While the Scottish Government recognises the political and economic objectives of the Eurozone, an independent Scotland will not seek membership"
"Will Scotland be forced to join the Euro? No"
"Scotland will continue to use the pound, just as we do today"
"Nor will we seek membership of the Schengen area." "Would an independent Scotland be forced to join the Schengen Agreement? No." "the Scottish Government will not seek to re-open budget discussions until the next funding cycle, at which point we will be negotiating as a full member state. Prior to 2020, the division of the share of the UK rebate will be a matter for agreement between the Scottish and Westminster Governments and the Scottish Government will argue for an equitable share"
"We will seek to negotiate an uplift in CAP Pillar 2 funding for rural development to invest in our rural services and economy"
"This status will give Scotland the opportunity to take a leadership role in reforming the Common Fisheries Policy"
"the Scottish Government will seek to retain the current flexibility to opt into new measures on Justice and Home Affairs." You will notice a lot of "seeking to" and "not Seeking to" with the definitive "No" only being used only in the context of being "forced to". So let's be absolutely clear about this: the White Paper is a negotiation wish list, nothing more. They have wisely avoided explicit promises on these matters (other than "continuing to keep the pound"; for how long of course is not clear) because they know nothing can be promised. Nobody should (or reasonably could) believe that all of the benefits and concessions "sought" will be achieved. Similarly nobody is arguing that an independent Scotland could be "forced" into anything either. It's a negotiation, Scotland can decide if the conditions placed on it to remain in the EU are too onerous, can choose not to remain in the EU, can decide to trade-off various elements of the wish-list in return for the benefit of remaining in the EU. It's a negotiation. So we need to understand the nature of this negotiation if we are to take an informed view of the likely outcome; how much of this wish list might we expect to actually happen and what concessions are likely? There has been (and continues to be) plenty of disagreement about the legal basis on which Scotland would be negotiating its position with the EU -- but for the sake of argument let's accept the most favourable scenario, the one the SNP base their case on: the written evidence provided to the Scottish parliament by Graham Avery. "In accession negotiations with non-member countries the EU has always strongly resisted other changes or opt-outs from the basic Treaties; at this stage it remains to be seen what might be requested by Scottish representatives concerning the euro or the Schengen area of free movement of persons. Without embarking here on a discussion of the implications for Scotland of these policies, we may note that although new member states are required to accept them in principle, they do not become members of the eurozone or Schengen immediately on accession"
"it remains to be seen whether Scottish representatives would request changes in the application of EU rules and policies, for example the fisheries policy or payments into the EU budget"
Now you might have though from the White Paper and the rhetoric used in debate that these issues don't "remain to be seen". I was fortunate enough to be able to ask Chic Brodie (SNP MSP, at an open debate in Gifford, 15/05/2014) why Mr Avery thought an independent Scottish government's position on these issues "remains to be seen" when they are laid out so clearly in the White Paper. His response was something along the lines of "maybe he hadn't managed to read all of the White Paper". I kid you not; there were about 100 witnesses. So Mr Avery's case is not predicated on the same assumptions as the White Paper with respect to the negotiating position of an independent Scottish government; or at least he has been careful to distance himself from those assumptions when making his case for a possible negotiated remaining in the EU. I personally think those statements are a tacit admission on his part that the conditions "sought" in the White Paper are clearly unachievable, but maybe I'm reaching a little there. Form your own view. Note also that we would "not become members of the eurozone or Schengen immediately on accession". There is an important point here. The SNP often adopts the line "we couldn't be made to join [Eurozone or Schengen] because we don't meet the conditions". Yet. We don't meet the conditions yet. Given all new member states have to join, it seems pretty much inevitable that legally binding commitments will be sought from an Independent Scotland to join these arrangements within a set period of becoming an new Member State. As I have mentioned elsewhere on this blog, Chic Brodie (SNP MSP) also offered that commitments to join the Euro would be inevitably required. Worth remembering that for when we come back to debate Currency Union in a different post. "..negotiations on the terms of Scottish membership should take place in the period following the referendum and before the date of independence. For that purpose, Article 48 would be the legal basis: this approach is sometimes described as ‘internal enlargement’. The alternative would be the traditional procedure for EU enlargement, under which non-member countries are admitted; this approach, which means that Scotland would have to leave the EU and then apply for membership under Article 49, would be undesirable for practical and political reasons. Neither of these legal bases would provide ‘automatic’ or ‘guaranteed’ EU membership for Scotland"
"a modification of the EU Treaties would be necessary, if only to provide for Scottish representation in the EU institutions (number of members of European Parliament, number of votes in Council of Ministers, etc.). "The main parties in negotiations for Scottish accession to the EU would be the member states (28 members after Croatia’s accession in 2013) and the Scottish government (as constituted under pre-independence arrangements). It may be noted that in this situation the government of Scotland - not yet an independent state - could not in fact submit an application for EU membership under Article 49 of the Treaty. But it could indicate its wish for Scotland to remain in the EU, and this would lead to negotiations in an appropriate framework to prepare the necessary modification of the Treaties. Proposals would be submitted for approval to the EU institutions and the Parliaments of 28 member states and of Scotland, and would come into force on the date of Scottish independence. Just to be totally clear on this, to quote directly from Article 48: "The amendments shall enter into force after being ratified by all the Member States in accordance with their respective constitutional requirements." Nowhere in Mr Avery's paper does he use the words "unanimous" or "veto" (which may be why the SNP likes it so much) but that is what this means: every one of the 28 member states has to agree to any Treaty amendments "in accordance with their own constitutional requirements" -- as I understand it that means in some cases even requiring a referendum on the issue in their own country, that it may be necessary for a referendum in France to be held to ratify the Treaty changes required. To quote Alex Barker of the FT on "how do you revise EU treaties": "The conference of member states will have to agree each and every tweak to the treaty by unanimity. All 27 [28 with Croatia] member states hold a veto and could stop the process in its tracks." So this is a tricky negotiation to say the least. How confident are we feeling about that wish list? Czech Republic: Minister of Foreign Affairs Karel Schwarzenberg said: "As far I as know the rules, if Scotland were to become independent, it would have to apply for the membership." He said, if that happened, Scotland would get a "worse deal" than it has as part of the UK. Latvia: Foreign Minister Edgars Rinkevics said, in the event of Scotland becoming an independent country: "The procedure of admitting a new member to the EU would have to be followed. All the chapters of negotiations have to be opened, duly negotiated and then closed." On whether the rest of the UK would continue as an EU member, he said: "I understand that the commission and colleagues from EU legal services are also currently considering that. I think we need solid legal opinion on this." Luxembourg; Foreign Minister Jean Asselborn said: "As we are all facing serious economic and social challenges, this is a time for solidarity between Member States of the EU and within Member States, rather than for going separate ways. This being said, Scotland's constitutional future is a matter to be decided by the people of Scotland. But its future within the EU is a matter for the whole EU and can thus only be determined with the agreement of all Member States." Netherlands: "The Netherlands government did not take any position yet, we'll first need to await the result of the referendum. The Netherlands believes Scotland today is a highly valued and integral part of the Union. If Scottish people opt for independence, EU and the member states will need to discuss specific consequences of this choice for Scottish / UK relations with EU." Slovakia: Minister of Foreign Affairs Miroslav Lajcak said: "There is no clear answer to this. In the end, it is a political decision made by all the member states." Spain; Spain indicated that the position stated by its Foreign Minister, Jose Manuel Garcia-Margallo, in October was still relevant. He told the Spanish senate: "In the hypothetical case of independence, Scotland would have to join the queue and ask to be admitted, needing the unanimous approval of all member states to obtain the status of a candidate country - and to sign the final treaty (of accession)." United Kingdom: "In the event of independence, the UK is confident that the remaining UK would be recognised as the continuator state and could continue to exercise the UK's existing international rights and obligations at international organisations such as the EU, NATO and the UN. The Scottish government has accepted that negotiations on membership would be required. This chimes with President Barroso's position, that any country separating from an EU member state would need to negotiate its own terms of membership. This is the UK government's assessment of international expert opinion." European Commission: European Commission president Jose Manuel Barosso said: "If one part of a country - I am not referring now to any specific one - wants to become an independent state, of course as an independent state it has to apply to the European membership according to the rules - that is obvious." The commission has said it can only comment specifically on Scottish independence if the UK government asks it to do so and details a precise scenario. Spanish prime minister Mariano Rajoy is on record as saying "if part of a member state becomes independent, it would be left out of the European Union, and it would be good for citizens (in the EU) and Scots to know that.” (see detail here). Italy and Belgium (like Spain) have strong separatist movements in their own countries so we can make an intelligent guess as to the position that they are likely to adopt. I know approximately nothing about international law and I am aware that many argue that some of the assertions made above may not stand up to legal scrutiny; I'd suggest that's not the point. The point is an independent Scotland would face an almighty challenge to achieve unanimous agreement from all 28 Member states given the clear (and understandable) resistance from some. Maybe glance your eye back over the wish-list of things that the White Paper explains the SNP will be seeking? So how is an independent Scotland being positioned for this negotiation? As recently as April 28th Alex Salmond was grabbing headlines [Alex Salmond's fisheries threat to EU alarms industry] by claimed that 12 European nations could be barred from Scottish and Norwegian waters if an independent Scotland was refused EU membership. A fairly major diplomatic gaffe it would be fair to say -- read the article if you don't see why. "negotiations on the terms of Scottish membership should take place in the period following the referendum and before the date of independence". "The 18 month period between the referendum and the planned date of formal independence provides sufficient time for discussions settling an independent Scotland’s terms of EU membership." So there we have it. A requirement for unanimous agreement from 28 Member states, clear resistance from many, antagonistic posturing from Alex Salmond, a wish-list that even the most optimistic separatists would appear to accept is unachievable and 18 months to negotiate it. What could possibly go wrong? "The Scottish Government believes that the EU provides the best international economic framework within which to optimise the economic and social gains from independence and to tackle the global challenges we, and other countries, face. Today the EU is the world?s largest single market, comprising upwards of 500 million consumers. Membership of the EU, and access to the Single Market, provides Scottish firms with access to more firms to trade with, and more potential customers to sell to. Independent membership of the EU will protect Scotland's vital place in the EU single market allowing for the free movement of goods, services, capital and persons. As a result an independent Scotland will, as a matter of EU law, retain unimpeded access to the markets of all EU member states, including of course markets in the remainder of the UK"
Understanding the nature of the context outlined here, would we be in a better position with respect to the EU following the discontinuity and renegotiation that separation from the UK would require? Is it realistic to assume that an independent Scotland could both remain in the EU and achieve even half of the White Paper wish-list? Is it realistic that full and productive participation in the EU can be achieved without making commitments to join the Euro? 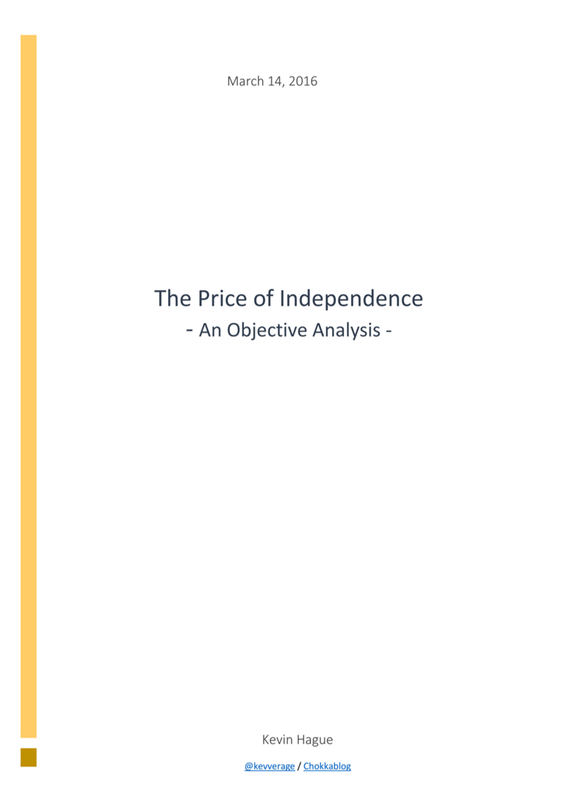 There are positive argument to be made for Independence (I will get to them, I promise); but they need to be argued for despite the costs and risks of getting there. not in denial of them. I would humbly suggest that having understood the broad context I have attempted to lay out here, narrowly argued claims made by the likes of "business for Scotland" (on whom more in another post) such as An independent Scotland would get a better deal from the EU might be considered with a pinch of salt. Why dance around the subject here? you hint at the diffculty in getting 28 EU members to line up and agree to clause 48 amendments... but we all know that this is paper thin doublespeak for the UK. It will object,it will try to veto... and why? because the UK establishment completely and utterly despises Scotland and it's people. If we ever seek to be more than the funny jocks in our skirts, the comic relief, then we will be derided, slapped down, diminished and thwarted in every way possible. For me, one of the strongest reasons to vote Yes is watching the mask slip during this referendum process. In the never ending assaults on every aspect of Scottish society, we have seen a glimpse of precisely how we are seen... and why on earth should we stay in a union with people who hate us so much? One easy way to test the force of an ambitious bit of analysis from Chokka is to read the comments posted below in the hope they may highlight weaknesses or contradictions in the arguments advanced. No such luck here. All we get is one sad, slightly paranoid comment, more personal ( to put it kindly) in tone than political, oblivious to the views of 28 EU member states - each with a veto. No, it's all about the English, which is very sad because if the English are as wicked as the writer suggests they'll still be there - all 55 million of them, just down the A1 - after the refo, whether Scots vote yes or No. Fortunately most English admire Scotland and the Scots, so we hope to stay united. Theojones ...... Silly wee boy, you should get out more. Who Says Scotland's too Small to be Independent? We should decide who Governs Us.